"Even first-time cookie makers can pull off super moist, tender, chewy macaroons. Using sweetened condensed milk streamlines the operation and produces a very nice texture. Simple to make and easy to transport, these are the ultimate cookies to bring to any potluck. Just stick an almond inside each macaroon if you want to relive that chocolate-coated coconut-filled candy bar of your childhood." Combine condensed milk, almond extract, vanilla extract, salt, and egg white in a bowl. Whisk until thoroughly combined. Add about 2 1/3 cups shredded coconut. Mix with a spatula until mixture is sticky and holds together. Form into balls using a sorbet scoop. Roll balls in remaining coconut. Space macaroons evenly onto a silicone-lined baking sheet. Bake in the preheated oven until golden, about 20 minutes. Let cool to room temperature, at least 20 minutes. Meanwhile, place 3/4 of the chocolate in top of a double boiler over simmering water. Stir frequently, scraping down the sides with a rubber spatula to avoid scorching, until chocolate is melted, about 5 minutes. Remove from heat and stir in the rest of the chocolate until it melts. Dip the base of each cooled macaroon about 1/8 inch into the chocolate. Place cookies, chocolate-side down, on parchment paper. Let chocolate harden completely. You can use sweetened coconut flakes, but the condensed milk is already very sweet. Regarding the chocolate dip, you can just melt and use any kind you like, but for that extra professional touch, I suggest tempering the chocolate before you dip. 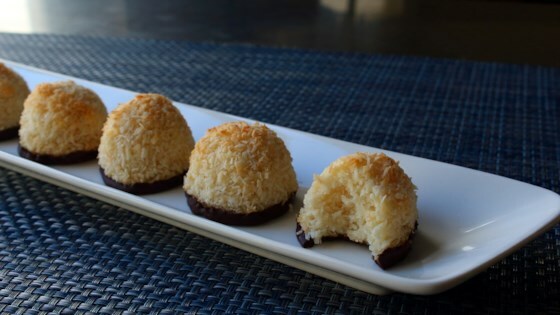 Rolling macaroons in additional coconut is optional. a great recipe made better. Today I added a few tablespoons of almond flour and baked them in mini muffin tins, totally delicious, chewy and moist. My husband's favorite! This turned out perfect! Thanks Chef!! I LOVE Chef John and this recipe - I've made these countless times and they are consistent, delicious and easy to do. Only change I'll ever make will be to double the recipe! So easy and delicious. I could not find unsweetened coconut, so I used the sweetened and it was fine. I got several compliments on them too! I used half sweetened and half unsweetened coconut because that is what I had on hand. Turned out perfect. Love, love, love!! !